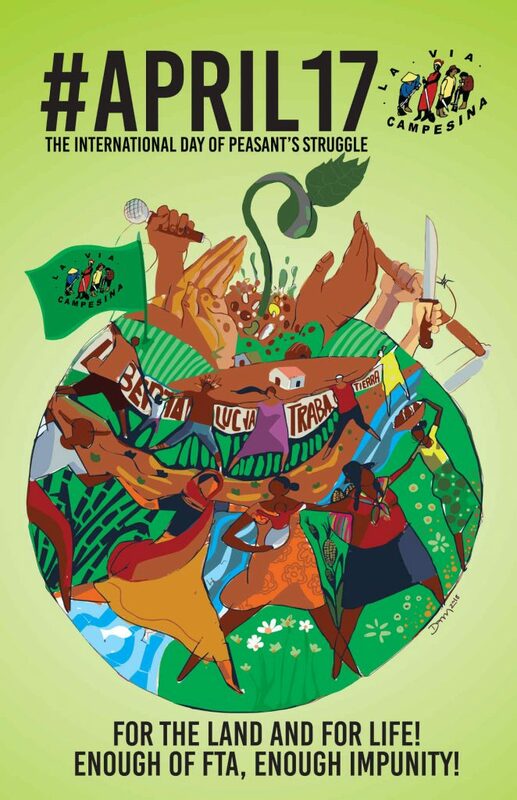 Every year, on the 17th of April, the International Day of Peasant’s Struggle of La Via Campesina, we commemorate the massacre of the landless peasants in 1996 in Eldorado dos Carajás, Brazil while struggling for comprehensive agrarian reform. During the protest, the Brazilian military police in the Amazonian State of Pará attacked members of the Landless Workers Movement (MST) blockading a highway, killing 19 and injuring hundreds of peasants. This #April17, in continuing the peasant struggle, we mobilise against Free Trade Agreements (FTAs), criminalisation of social struggles, and for the land, territories and water and #FoodSovereignty. We call on our members, allies, friends, and communities worldwide to join us through direct actions, cultural activities, conferences, film screenings, community debates and rallies to denounce the advance of capital over the peoples and their territories for profits. Send (lvcweb@viacampesina.org) all the planned actions and activities so that we capture and share on the global action map. We feed our people and build movement to change the world! Against the plunder of capital and empire, for the land and the sovereignty of our people!